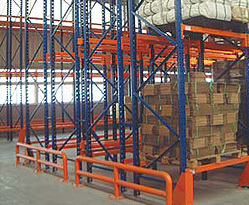 Adjustable pallet racking (APR), commonly known as selective racking, is the most versatile and cost-effective storage system for wholesale, factory and retail warehousing environments. There are several types of APR configurations that provide different solutions to your key logistic challenges: space, retrieval efficiency and cost. The bottom line is your competitiveness and profitability. 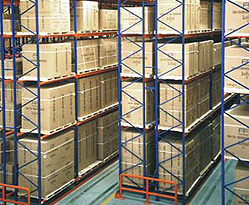 Single selective pallet rackingis the most popular and economical form of pallet racking. It’s designed foreasy access to a large number of different product SKU’s. Aisle widths range from 2500mm upwards, while standard beam lengths are 1370mm for single entry bays and 2600mm or 2700mm for double entry bays. Walkie straddle stackers require 2700mm beams with straddles on edge. Double-deep APR is the most cost-effective solution for high floor area utilisation in facilities that have large quantities of the same SKU. Aisle widths range from 3000-3500mm. Standard beam lengths are 1370mm for single pallet bays and 2600mm or 2700mm for double pallet bays. 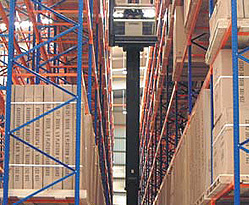 It can increase storage capacity by 17% over a selective racking configuration. It is an efficient design that increases storage density at a relatively low capital cost. Stock access: First-In-Last-Out. Ideal for large warehouses that require fast pick rates and easy access to a large number of different product SKU’s. Aisle widths range from 1500-2300mm. Standard beam lengths are 1370mm for single entry bays and 2600mm or 2700mm for double entry bays. This highly efficient floor space solution requires specialist handling equipment and a wire or rail guidance system. Best combination of floor space and stock access. Please enquire about selective pallet racking today.